1868 July 28th. Born in Munich the son of Isidore and Johanna Railing. 1911 Became naturalised British subject. Electrical Engineer and Director of Public Company. THE British electrical engineering industry has lost one of its pioneer workers by the death of Mr. Max John Railing, the vice-chairman and joint managing director of the General Electric Company, Ltd., which took place at his home, "Whiteknights," Reading, on January 14th, 1942, in his seventy-fourth year. His whole life had been devoted to the company with which he was associated for fifty years. He started business with Lord Hirst, who, right from the beginning, realised and appreciated his great qualities, and found in him an able collaborator in the work of building up the G.E.C. from small beginnings to its present position as one of the leading British electrical manufacturing companies. At the beginning of Mr. Railing's career the electrical industry was only in the earliest stages of its development. It was his clear and far-sighted realisation of its possibilities, as well as his own strong personal character and exceptional ability that made him rise to become an outstanding figure in the electrical industry of this country. His earliest work with his firm was the development of the fittings and illumination department. From that he progressed rapidly into ever-widening spheres of responsibility. In 1901 he was selected to take control of the newly formed G.E.C. Engineering Works at Witton, Birmingham. At that time most of the localised electricity undertakings and other large buyers were accustomed to go abroad for their plant, largely owing to the early electric lighting legislation in this country. It required at that time a great deal of courage and perseverance, supported by a belief in the brilliant future of electricity, to create an organisation for the manufacture of heavy electrical machinery, and to convince purchasers that it was in their interests to entrust to a British manufacturing firm orders for plant and equipment that had not previously been designed or constructed in this country. With the full-hearted backing and encouragement of Lord Hirst, Railing succeeded, and the result was seen in the steady expansion of the factories under his control. Apart from the manufacture of heavy plant, other factories were brought into being as essential to the country's needs, until upon the bare meadow land of the original site stood a group of inter-related engineering works employing the population of a fair-sized town. 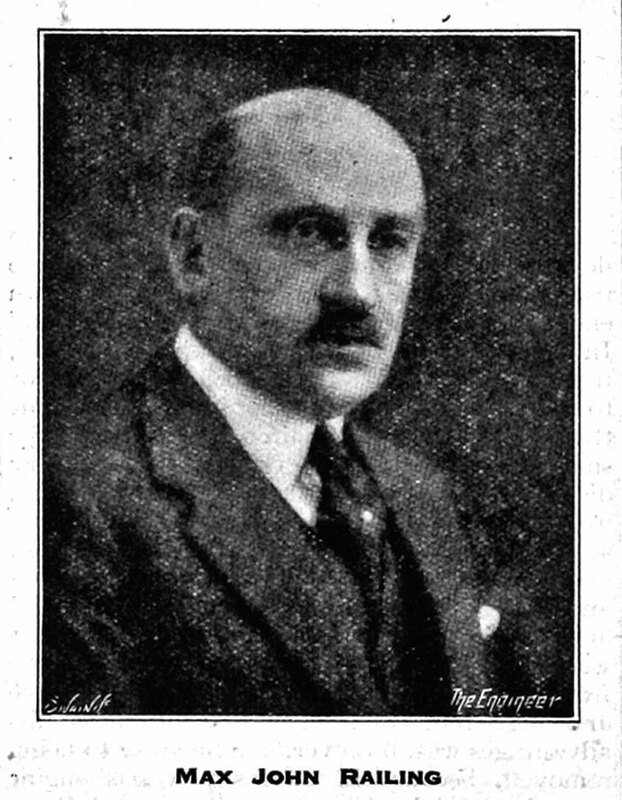 In 1910 Mr. Railing returned to London as general manager of the company. The duties involved in such a position, at that time already heavy enough, increased every year, for the growth of the company was continuous. New branches were established at home and overseas; new fields of application were entered; additional works were acquired and existing factories enlarged; subsidiary companies were formed, until the company's interests and activities covered the whole field of electrical engineering and application, demanding supervision of a very exacting nature. Only a man of rare capacity and deep understanding of the technical organisation and human problems involved could have succeeded in the arduous administrative labours such a task entailed. In 1929 Mr. Railing became joint managing director, and in 1933 vice-chairman of the company. His work in helping to build up the vast undertaking of the G.E.C. with its interests ranging over the heavy engineering industry, the cable industry, the telephone industry, the radio industry, the electric lamp industry, the electricity supply industry, and many others - interests which were worldwide in extent - made him a leading figure on all questions affecting these industries in both the national and international fields. In many of them he was a pioneer, and during his lifetime his work contributed in no small measure to the expansion which placed British electrical engineering in the forefront of the world. Mr. Railing held strong views on the necessity for organisation of industry. He was a member of the Institution of Electrical Engineers and took an active interest in the formation of the British Electrical and Allied Manufacturers' Association in 1912, and in all its activities from then onwards. For three years, from 1932 to 1935, he was Chairman of the Council, and thereafter a Vice-President until his death. He played a leading part in many of the other organisations and committees which largely control the destinies of electrical manufacturing and allied branches of industrial enterprise. Hi knowledge and experience were often drawn upon in the national interest. He served for a considerable time as a member of the Board of Trade Advisory Council, where his intimate acquaintance not only with the electrical industry of this and other countries, but with world-wide problems of manufacture, research and development and trade fitted him to give valuable assistance. In the last years of his life he threw all his great energies, regardless of his health into the problems which confronted the country when the war clouds began to gather. He died as he had lived - at his post to the last, unflagging in his efforts to ensure that the company to which he had contributed so much should respond in full to every call made upon it in this hour of the country's need. MAX JOHN RAILING spent the whole of his very long and active career in the service of the General Electric Co. Whatever virtue that Company has reflects his personality; for Lord Hirst early chose him as his chief collaborator in the building up and management of the Company. In all questions of staff relationships, of management or of policy, Mr. Railing wholeheartedly interpreted his chief's guidance and for well-nigh 50 years contributed unstintingly of his own genius to the Company he served. He joined the General Electric Co. as a young man of 24 in 1892. In 1901 when the new heavy engineering works were starting at Witton, he left London to take charge and to build them up. Those were days when it had to be demonstrated to station engineers that it was possible to produce in England heavy electrical plant equal to that made on the Continent. At 42 he was made General Manager of the Company, and later Joint Managing Director and then Vice-Chairman. He joined The Institution as an Associate in 1898 and was transferred to full Membership in 1907. He served for many years on the Committee of the Birmingham Local Section (now South Midland Centre) and was Chairman in 1910-11. His leadership of the B.E.A.M.A. in the early days was strong and statesmanlike, and the constant support he subsequently gave to.it constituted a major contribution to organization within the electrical industry. It was, however, as a just man of strong character and as an industrial leader that Max Railing will be remembered. He was a great worker, never sparing himself, but the work he did was not work which should have been done by subordinates. He did the work which a manager should do, trusting and helping subordinates with counsel and guidance. He was a strong believer in the overwhelming value of personal contact and of the spoken word - of friendship and affection shown in the daily round of work. He returned loyalty tenfold for loyalty shown, and the friendships and trust so formed were a reward to him in themselves. Authority with him was patriarchal, and he had no liking for power for its own sake. At a period when it was not fashionable for industry to spend money on science, he showed his wholehearted belief in the place of science in industry, by fostering Lord Hirst's policy of a large central G.E.C. research organization to supplement the work of the factory laboratories of the Company. But he realized early that a large research laboratory and its staff were not enough to ensure success, and he put all his influence behind an organization for bringing the scientific facilities of the laboratories to bear upon the Company's day-to-day technical needs. He kept in the closest touch and guided the development of the organization in the field of the heavy-plant industry, the communication industry, lighting industry and the many fields of distribution and domestic appliances. Such a man makes many friends and he became one of the best-known personalities in the electrical industry. He regularly attended the annual functions of The Institution and was a constant supporter of the Dynamicables and the "25 Club"; his genial courtesy endeared him to all, and his wide interest in people and things made him a good conversationalist and a happy speaker in public. He died, as he would have wished, at his post. This page was last edited on 4 February 2019, at 13:37.